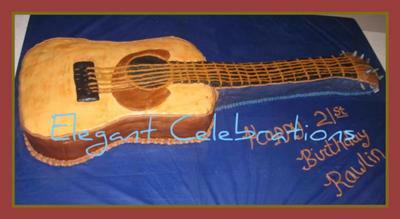 To make this acoustic guitar cake, I baked two 11x15 cakes and one 9x13 cake. I stacked the 11x15 cakes and carved them out in the shape of the guitar body. I then formed the neck of the guitar by cutting rectangular pieces of the 9x13 and stacked them on top of each other and end to end to make the shape and length of the neck that I wanted. I covered the cake in rolled buttercream covering each section separately in order to put in the individual colors. The beige for top of the body of the guitar was painted with brown Americolor paste mixed with vanilla. I used a pastry brush to apply this. I used dark blue rolled buttercream matched to the board to cover the cake underneath the neck to create the illusion that it was open space. The tuners were formed from gumpaste and allowed to dry and then put into the cake using toothpicks. I used fondant to make the black piece that holds the strings on the body section of the guitar. The strings were piped using chocolate frosting.